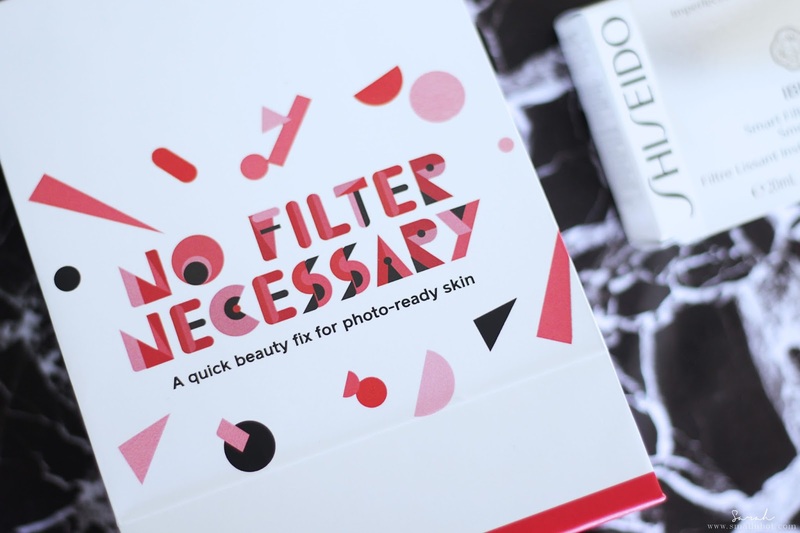 Shiseido Ibuki Smart Filtering Smoother - Picture Perfect Skin with No Filter ? Most of you are probably familiar with Shiseido. 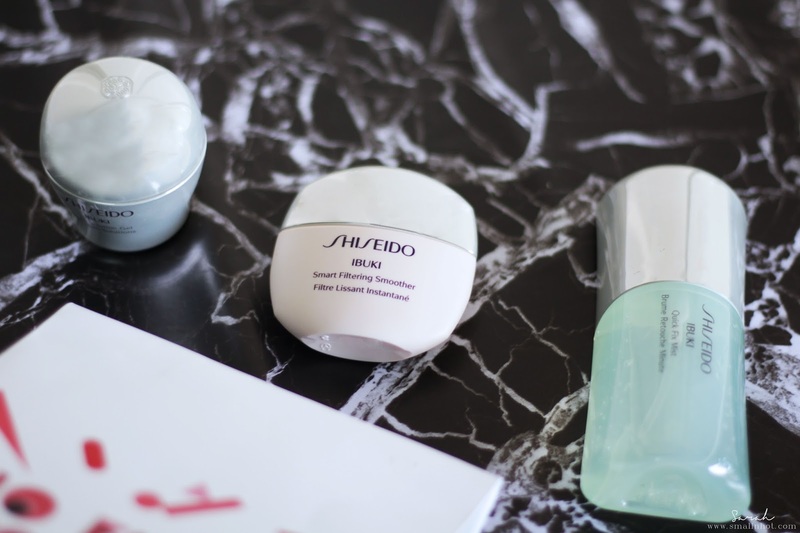 It's one of my more trusted Japanese skincare brands out there, As their products usually deliver whats promised, Recently Shiseido launched a new product within the Ibuki range. and here's my experience with this new Shiseido Ibuki Smart Filtering Smoother and another "semi-favourite" of mine, Ibuki Quick Fix Mist. Find out more below. picture perfect skin without any beauty filters ? Shiseido Ibuki Smart Filtering Smoother. A light, velvety skin blurring solution that acts as smart filter, for beautifully photogenic skin. It immediately absorbs excess sebum and makes pores less noticeable. Sleek and compact, the container slips easily into your pocket, so you can touch up anywhere for instantly smooth skin that lasts all day long. You'll LIKE it if your have oily skin or your T-zone gets oily very fast after a few hours of having makeup on because this will mattify everything, leaving skin with a smooth and matte look. You'll HATE it if the Korean dewy skin makeup is what you are after. To me this is the original, and probably the best, "liquid compact powder" I have ever owned. Nothing else really compares or even comes close. 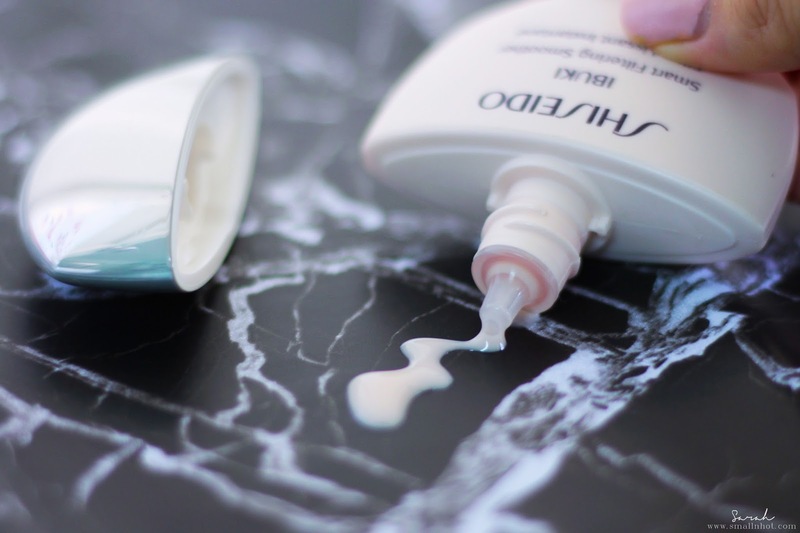 Shiseido developed this product in a skincare form with no colour or shades, so don't fret if you're wondering whether this milky pink colour will work with your skin. The Shiseido Ibuki Smart Filtering Smoother comes in a liquid form and all you need is just a drop of the product to pat it on your oily T-zone (do not swipe or rub it in else you'll end up with makeup smudging all over) and it will instantly matte up that area, creating smooth, powdery and matte finish. The best part is the fact that it doesn't feel like it disrupts your makeup at all or heavy on the skin. Because it's so light in texture, it just blends in effortlessly by just a light patting motion. It's also worth noting that the Smart Filtering Smoother comes in a slim round design, making it fit in our handbag easily just like any other compact powder. If I feel like I'm looking too matte and powdery, I would spritz mist, usually thermal water but today I'm going to talk about the Shiseido Ibuki Quick Fix Mist instead. Shiseido Ibuki Quick Fix Mist. A dewy, refreshing gel that sprays into a mist to instantly improve shine, dehydration and day-worn skin conditions caused by daytime stresses, to keep your skin fresh all day with every use. The portable bottle allows you to mist anytime, anywhere, so you can always experience you skin in its best condition. You'll LIKE it if you have dry and dehydrated skin. You'll HATE it if you prefer an unscented mist. And looking for something that has a cooling effect after spraying. Facial mist/sprays are an amazing thing and they are pretty integral to my post-makeup routine. I would always have a bottle of thermal water mist in my handbag as I go out, to keep my skin well hydrated. And last month, I decided to try something new and switched out my Uriage Thermal Water to the Shiseido Ibuki Quick Fix Mist. Let's see how it works on my skin ? I won't bore you with the list of ingredients but it's basically the Ibuki Gel in the form of a multi-tasking mist that's designed to hydrate. You can pop it on as the last step of your skincare routine and leave it as that. I personally like this as a post-makeup or on-the-go hydration boost by lightly spraying over my makeup if I am feeling really dull and this will give an instant hydration boost to my skin. It provides a more intense hydration to my skin as compared to thermal water mist but the downside is that it doesn't have the cooling sensation as you spray it on your skin. I think it's mainly because of the packaging, as thermal water is cased in a metal canister whereas Ibuki Quick Fix Mist is housed in a plastic-like container. Unlike any other thermal water facial mist, I would suggest that less is more when it comes to this stuff. Just one or two (three at most) is all you need to do your whole face. Also do have your mouth close when spraying as the product is scented,t. 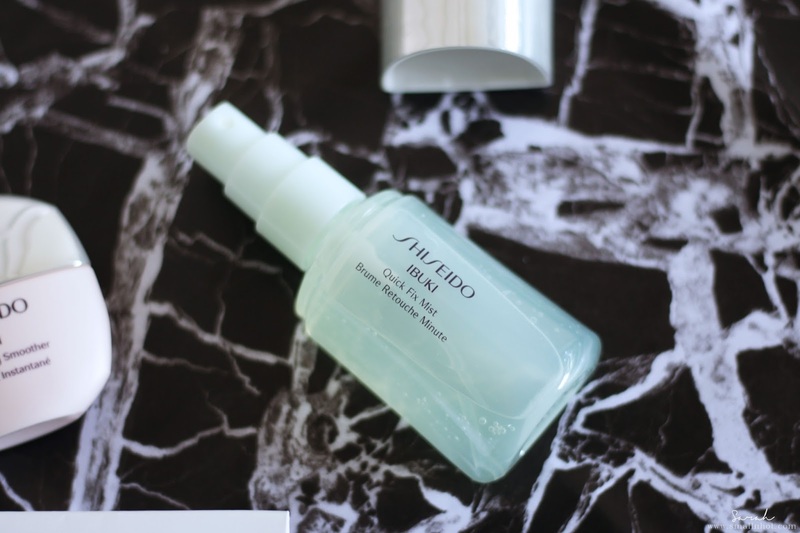 The Shiseido Ibuki Quick Fix Mist is certainly not a "must-have" kind of skincare product as it's pricey, but if you have dry skin this this for you. 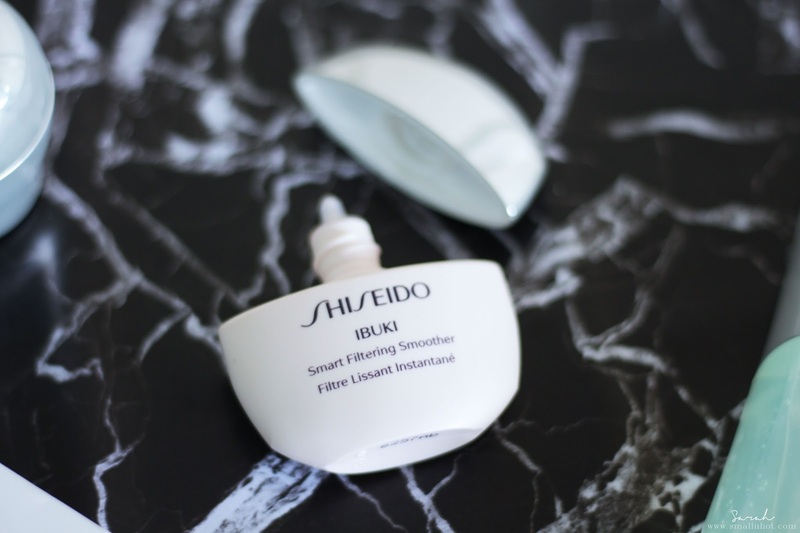 Overall, it's a HIT for the Shiseido Ibuki Smart Filtering Smoother and a semi-HIT for the Shiseido Ibuki Quick Fix Mist. The reason for this is, Smart Filter Smoother is something new and innovative that no skincare brand has ever done, also the part that it works like magic when mattifying my oily T-zone; whereas the Quick Fix Mist is not like other hydrating facial mist. Don't get me wrong, it works great as a hydration boost but I'm quite bothered by the scent of the product as it touches my lips. For the price of $25, I think I'll stick to my Uriage Thermal Water for hydration on the go.